SANTA CLARA, CA--(Marketwired - Dec 10, 2015) - Ooyala, a Telstra subsidiary and a leading innovator in premium video publishing, analytics and monetization, released its Q3 2015 Global Video Index, showing mobile video consumption in Europe hit 53 percent of all online video plays in the region, surpassing the global trend of 45 percent in Q3 2015. 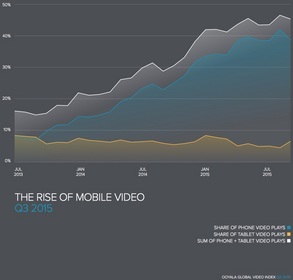 The trend indicates particular regions are further along in the adoption of mobile phones and tablets as a primary screen for video consumption as mobile continues to grow across all markets. The report indicates programmatic transactions are becoming a norm for premium publishers, increasing more than 100 percent quarter over quarter. It also gives insight into fan engagement with sports content before and after game days, delivering insight into how sports providers can tailor strategies to boost video views and maximize revenue. 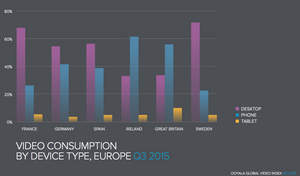 Great Britain and Ireland led Europe's most populous nations in mobile viewing as smartphones and tablets made up two thirds of all online viewing in those two nations. Those two by far surpass the global average of 45 percent and largely contribute to Europe's total average of 53 percent. This quarter also showed how smartphones lead the charge in mobile viewing, as 88 percent of all mobile video views were on smartphones, leaving tablets at 12 percent. Further, Ooyala analyzed fan engagement for a popular European sports club over a 45-day period during Q3, comparing sports video consumption around game days and non-game days. The results show that fans, on average, play 75 percent more videos on the day prior to any given match, and more than 100 percent more on the day after when they come looking for highlights, game summaries and match replays. Combined, the two trends show a broad three-day window for content providers to maximize fan engagement and ad revenue around game day as well as to increase viewership across all devices, particularly mobile. Data pulled from customers using Ooyala Pulse SSP, Europe's leading programmatic trading platform, shows increased traction for programmatic trading among premium video providers. Ooyala saw its number of Deal ID deals -- agreements for executing fixed-price transactions programmatically -- more than double quarter over quarter, at a rate of 103 percent. As a result, the volume of Deal ID transactions -- that is, paid ad impressions resulting from those deals -- increased 150 percent quarter over quarter. Meanwhile, overall real-time bidding grew 235 percent since Q2 2015. These statistics reveal that programmatic deals are becoming routine. They're on a trajectory toward becoming a norm, rather than an exception, in video advertising. "Leading into 2016, it's abundantly clear that video -- both delivery and advertising -- is scaling massively across all screens," said Jonathan Wilner, vice president of product and strategy for Ooyala. "For premium content providers the major opportunity today is getting smarter about their video strategy. Video providers need to know to leverage timely events, tap into new advertising technology, understand how their audience is engaging with content and optimize their video business accordingly to maximize returns. These types of business insights, rooted in data, are exactly what we provide our customers." 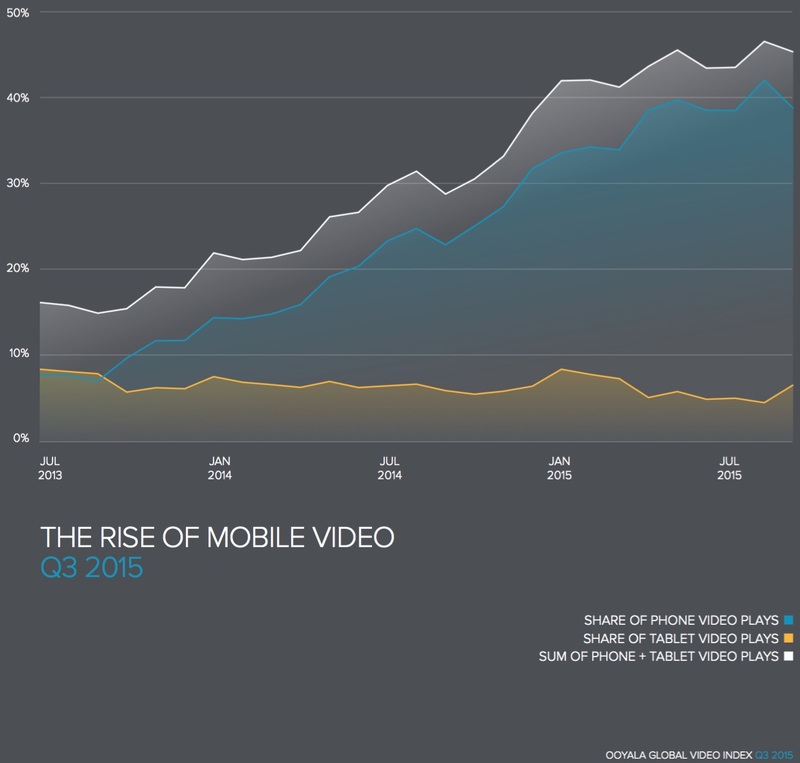 In Q3, mobile video share of plays is up 50% from the past year. 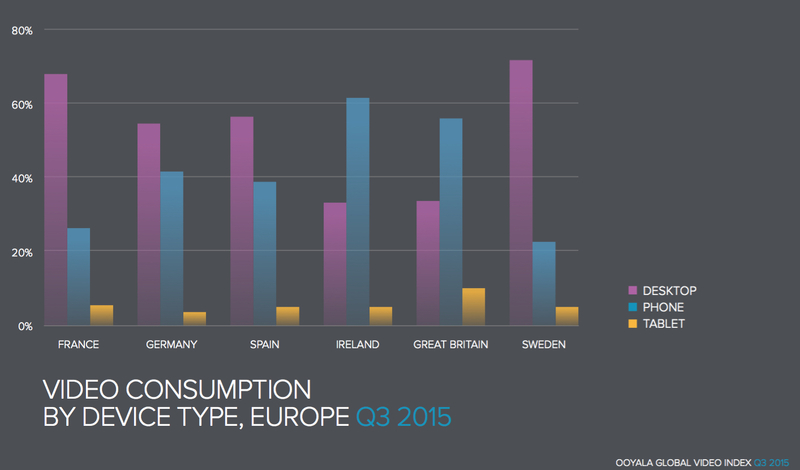 Ireland averages more sports viewing on mobile devices at 51% than the rest of Europe and the U.S., both at 39%. Despite mobile growth, consumers still prefer larger screens for longer content. Over the past nine months, for video over 10 minutes long, the share of time watched on connected TVs (CTV) increased from 43% to 71%. For publishers specifically, tablet (32%) and smartphone (24%) ad impressions dominated at the expense of PCs. Publisher ad impressions on PCs have declined 22% since the first quarter. Tablets had the second-largest share of overall time watched at 35%, down slightly from 40% in Q1. But tablets dominate share of time watched for content 10-30 minutes long, the length typical of episodic TV, at 20%. Ooyala helps deliver content that connects. A US-based subsidiary of global telecommunications and IT services company Telstra, Ooyala's comprehensive suite of offerings includes one of the world's largest premium video platforms and a leading ad serving solution. Built with superior analytics capabilities for advanced business intelligence and a strong commitment to customers' success, Ooyala's industry-leading end-to-end solutions help large-scale broadcasters, operators, media companies, enterprises and brands build more engaged and more profitable audiences, and monetize video and TV with personalized, interactive experiences across any screen. ESPN, Univision, Sky Sports (U.K.), Foxtel (Australia), NBCUniversal, RTL Group (Germany), M6 (France), TV4 (Sweden), Mediaset (Spain) and STV (U.K.): these are just a few of the hundreds of broadcasters and media companies who choose Ooyala. Headquartered in Silicon Valley, Ooyala has offices in New York, London, Stockholm, Sydney, Tokyo, Singapore, Cologne, Madrid, Paris and Guadalajara, and sales operations in many other countries across the globe. For more information, visit www.ooyala.com.